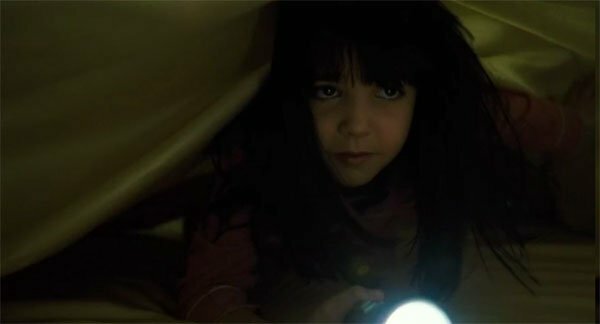 Guillermo del Toro’s Don’t Be Afraid of the Dark is as murky and ill-conceived as its multitude of dimly-lit corners. Out in theaters on August 26th, Don’t Be Afraid of the Dark starts out with infinite possibilities and a great disturbing opening scene, just to devolve into a somewhat ridiculous creature feature. Del Toro co-wrote and co-produced Don’t Be Afraid of the Dark, so my expectations were very high. His touch is detectable in the film, but feels muted. The film starts off as a spooky old-fashioned ghost story, and those elements worked extremely well. In fact, the first act had some great subtle scares and chilling moments, a la the best of del Toro. But as soon as the whispering voices start, and the creatures are revealed, the film takes a turn toward the ridiculous. It simply isn’t scary once the little “tooth fairies” make an appearance, and the last two thirds of the film feel like a different movie altogether. This lack of cohesion is a big problem, and coupled with non-scary monsters if makes for an atmospheric film that simply doesn’t live up to its potential. From one moment to the next I was left wondering where the story would go; spooky horror, creature feature, twisted fairytale, emotional drama or thriller. The opening scene was one of the best scenes in the whole movie. It set the right tone; dark and disturbing. A grand old house harbors a terrible secret in the basement, something that lives in the walls and the underground tunnels beneath the house, something that whispers in the darkness and craves the teeth of children. Fast forward a few decades and meet young Sally, a child torn between divorced parents. She is sullen and feels unwanted. Her mother has put her on a plane to go live with her father, whose live-in girlfriend is an interior designer helping him renovate the old house. Sally immediately is drawn to the house and the grounds, a lonely wild place with eerie shadowed corners. When she discovers the basement, the voices begin to call to her. At first she thinks they might be friendly, understanding her pain and commiserating with her for being unwanted. But soon she finds out they’re mean horrific little creatures bent on hurting her and everyone around her. Her father, Alex, is mostly oblivious to the goings on around him, buried in his work and then worried that his daughter is going crazy. The “stepmother” Kim is a more sympathetic character, trying very hard to make a connection with Sally, and first believing her story when strange things start happening. The story in Don’t Be Afraid of the Dark is rather simple. It’s based on a ‘70s teleplay that del Toro believes is the scariest TV production ever made. He worked closely with newbie director Troy Nixey to bring his vision for the story to modern life. Even so, after the initial set up, Don’t Be Afraid of the Dark lacked the authentic creeping horror and brutality of some of del Toro’s greatest horror works, like Pan’s Labyrinth and The Devil’s Backbone. There were glimpses of del Toro’s wonderful artistic sensibilities, and the scenery and sets went far to build a spooky and menacing atmosphere. Some of the touches I recognized from him were the macabre nature scenes and tree motifs. And some of Nixey’s scene compositions and angles made for creepy moments, but none of it was enough to overcome the two main detractors; the story development and the wee little antagonists (aka evil fairies). The story lacked cohesion in a big way, with some of the characters doing bizarre things without accurate explanation. There were all these different aspects of the story that del Toro and fellow writer Matthew Robbins tried desperately to meld together. First the evil little fairy things wanted teeth, then they needed a human sacrifice to replenish their ranks. Then they wanted to get out, then they wanted to go back in hiding. And there was the fairytale/mythology aspect thrown in too. All of this goes on with a decided lack of emotional tension or audience engagement. What doomed the film, for me, were the gremlin-esque creatures. As with many of these kinds of horror films (the ones with a multitude of small evil monsters on the loose) it’s hard for filmmakers to make them truly terrifying. The scenes that are supposed to be the scariest sometimes come across the most ridiculous. Alas, Don’t be Afraid of the Dark suffered that fate. The “fairies” were certainly ugly. They looked like a cross between huge rats and malformed wingless bats, with sharp claws and teeth. And sometimes they were even menacing. But that was only when they were heard and not seen, or when they were just in shadows manipulating objects. The minute they popped out into the dim light or started attacking en mass they lost their edge. I kept thinking, as I did when watching films like Child’s Play and Puppetmaster, ‘why don’t the big people just step on them and squash them?’. I always find myself chuckling at the impossibility of tiny evil creatures wielding scissors or knives taking down a full grown human. The little creatures in Don’t Be Afraid of the Dark have everyone running around scared, and when Sally finally takes a flashlight and smashes one you find yourself wondering why none of them tried that before. On the upside, I didn’t find too much to complain about regarding the CGI. Even though the creatures ended up less than scary, they looked realistic enough. The design and artwork erred on the side of realism, with tufts of fur on leathery creatures, and white round eyes because of their subterranean existence. Movements were effective, and though I’m no fan of CGI reliance in horror special effects, I think the creature effects were above average here. Katie Holmes played Kim, and as usual I found her performance underwhelming. She looked really tired the whole film, and the range of emotions one would imagine playing over her face usually ended up being one of about three she could portray successfully. All in all, she made one of the central characters of the film boring and almost unlikable. Young Bailee Madison stole the show. Her Sally was sullen and moody, but vulnerable too. And she can certainly do scared, which is a necessity when you’re starring in a horror pic. She has a round-faced innocence that is immediately endearing and sympathetic, and she could handle the emotional moments with more expression than some of her adult counterparts (see Holmes). Finally, rounding out the main cast was the versatile Aussie Guy Pearce as the careless father. Pearce has taken on an amazing range of roles over his career, and brought something unique to each one. He really wasn’t given much to work with in this role, and I’m not enthusiastic about his performance. He was just a little lackluster and played the father-with-family-issues pedantically. Don’t Be Afraid of the Dark had some spooky moments and effective atmosphere, but the story lacked emotional sustenance and cohesion. The fun “things that go bump in the night” theme devolved into a ridiculous game of stomp the tooth fairy. Del Toro was attempting to build some nice mythology groundwork, but didn’t follow through with it thoroughly enough to make real sense. If you go into this film with low expectations, you may come out pleased enough. Fans of del Toro may appreciate his touch, but will ultimately be disappointed there wasn’t more of it.